Shortly after its organization, the Division secured quarters of its own over 20 Main Street. The annual banquets, card parties and dances, etc., held there were the subject of many recollections among our deceased members. As the membership grew, it was found that larger quarters were necessary. Around 1913, a lease was secured and the organization moved to the third floor of the Hodge Opera Building. The present Bewley Building occupies the space formerly known as the the Hodge Opera. In addition to a large session hall, there was a card and billiard room, a library, a parlor and a kitchen. The membership enjoyed the privileges provided on a daily basis. Then, the United States were embroiled in the First World War. With a membership at the time of nearly 230, seventy-six, or practically one-third of its members were enrolled in the military. The early twenties through 1928 were the "Glory Days" for the Division. Membership was high, with as many as 700 dues-paying members. Bob Mahaney was president in 1924 & 1925, The year 1925 was a landmark year for the A.O.H. Irish, in that the State Convention was held here. Headquarters was in the Kenmore Hotel. The first "small town" State Convention as proclaimed by many as the best one ever. There were 600 delegates at the Convention. Train excursions to Niagara Falls, a Convention Ball, the usual meetings, athletic events and many other activities were well attended. In 1926-1927, Tony Haley was President, followed by his old pal Ray Barnum, who reigned from 1928 to 1931. On February 25, 1928, a fire destroyed the Hodge Opera Building. Not only did the A.O.H. lose their quarters, but all records, memorabilia and equipment. 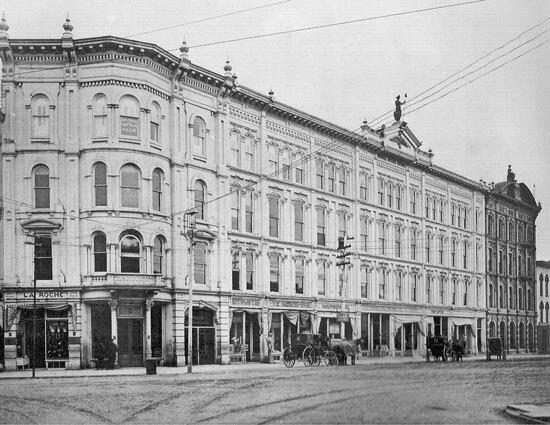 Temporary quarters were secured on Main Street, about where Urban Towers stands today, and consideration was given to the purchase of the Coliseum (corner of Park Avenue and Hawley) and converting it to an Irish Center. In the early thirties widespread unemployment and increased use of autos and radio resulted in the loss of many members. It was apparent the the club rooms were no longer an asset. An invitation to meet at the Exempt Fireman's Club was accepted and meetings were held thre for several years. During these years George Eddy was President in 1932-1933, Ed Ryan, Sr. in 1934-1936, Jerry Tracy in 1937-1939, Reg Epps in 1940-1941, and Gene Ryan in 1942-1943. The organization became a private fraternal group, and although membership declined rapidly, the men who made up the nucleus of the Division were dedicated and worked diligently for the cause of the Order. The Division added some varied activities during these early years of the 80's. Francis McElheny served from 1984-1986. Under his reign the "Irish Feast" was instituted. It has been held at the Kenan Center and the attendance has reached as high as 800. Francis was a tireless president and the Division flourished during his term. Jim Castle was elected in 1987 and that year alone saw nearly 50 new members join the Division. Also, through the help of Assemblyman Matt Murphy, the Division was able to secure the funds and make preliminary plans to erect a monument to the Irish who helped build the canal. Also, the Division marched in the Buffalo Parade for the first time, and the Division began marching in Lockport's Memorial Day Parade. Jerry FitzGerald has the distinction of being president in the 100th year of the Division's existence. The Division has no plans in the immediate future to secure their own club rooms. It is financially sound and supports many local charities and promotes Irish history and culture. For the past few years, the Division has donated monies for Irish publications to the Public Library.